The pie that just about shows up on Arkansas menus everywhere is known as "possum" pie. So named because it "plays possum," in that it represents itself as something else. 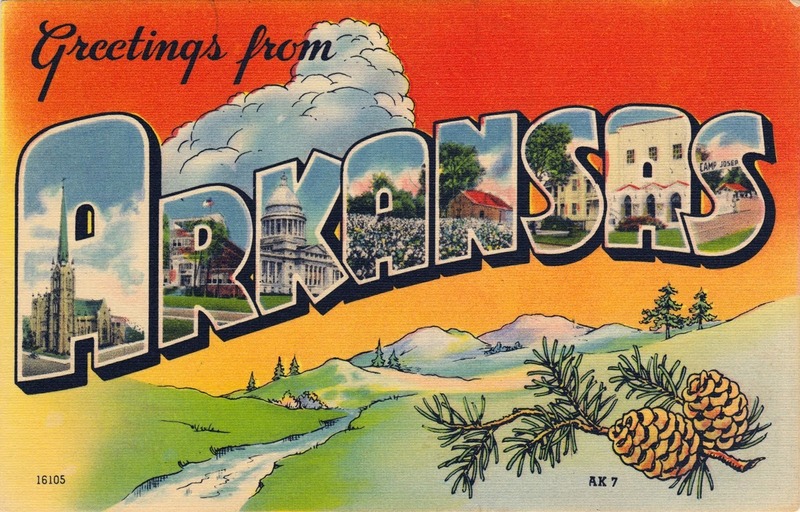 It's also known by a lot of other monikers in Arkansas such as Four-Layer Pie, Striped Delight, and Chocolate Layer Pie. The traditional pie starts with a sandy bottom, a mix of flour and pecan pieces pressed directly onto the pie pan and blind-baked before assembly. The rest of the pie isn't baked. 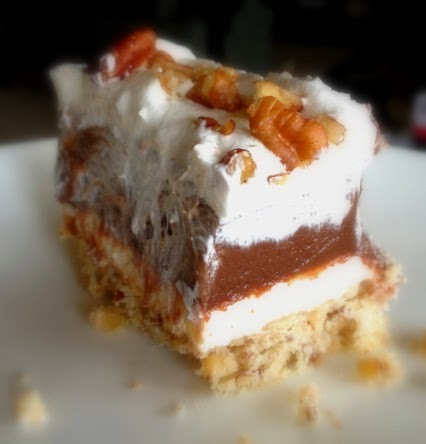 The filling consists of a cream-cheese layer, followed by a layer of rich chocolate pudding, topped with a layer of whipped cream toasted pecan bits. If you don't know the chocolate is in there, it looks like some sort of strange pecan-cream pie hybrid. Toast pecans first by baking whole nuts in a single layer on a cookie sheet for about 8 minutes at 350 F. Stir once or twice while they bake. Keep an eye on them, nuts burn easily. Pulse all of these ingredients together in a food processor. Alternatively, mix thoroughly with an electric mixer or by hand. Press into the bottom and up the side of a 10-inch pie plate. Place in the refrigerator until ready to bake. Preheat oven to 350º F. Bake crust for approximately 12-15 minutes until lightly golden; set aside to cool completely. It can be frozen at this point. In a small bowl, beat cream cheese and sugar until smooth. Evenly distribute this filling over the graham cracker crust - OR - pecan shortbread crust. In a bowl, whisk the milk, vanilla, and pudding mixes for 2 minutes. Let stand for 2 minutes or until soft-set. Sprinkle chopped pecans over cream cheese layer, then spoon pudding over both. Refrigerate for at least 4 hours. In a medium saucepan, whisk together the sugar, cocoa powder, flour, cornstarch, and salt. Combine the eggs yolks and milk, breaking up the yolks with a fork, and then pour the mixture over the dry ingredients in the saucepan. Whisk until smooth. Cook over medium heat, stirring constantly, until the pudding thickens and boils, about 6-8 minutes. Remove from heat, and stir in the butter and vanilla. Scrape into a shallow bowl, smoothing the top of the pudding, and press a piece of waxed paper over the surface to prevent a skin from forming. Let cool for 30 minutes. Spread whipped cream over the chocolate layer. Sprinkle with chopped pecans and grate some of the dark chocolate bar over the top.